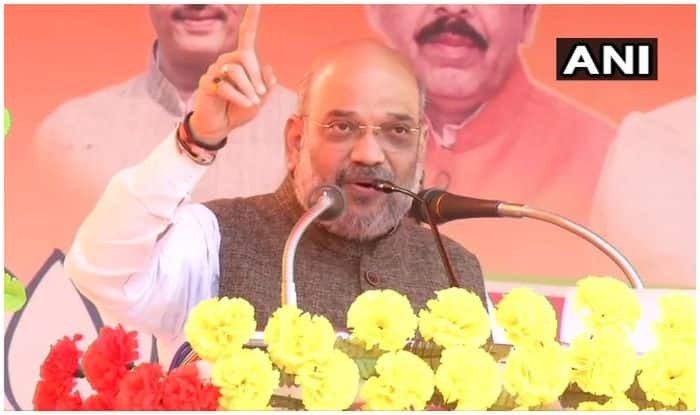 Shah, while addressing 'Vijay Sankalp' rally said that country would have a new PM everyday of the week if the grand alliance comes to power in Lok Sabha elections 2019. New Delhi: BJP president Amit Shah on Saturday accused the Opposition of treating illegal immigrants as a vote bank and doing ‘Ilu Ilu’ with terrorists, an apparent reference to a popular Bollywood love song from the nineties where in ‘Ilu Ilu’ is an acronym for I love you. “The BJP wants to take the intruders out (of the country) but the BSP-SP and the Congress do not want this as they consider them their vote bank,” Shah said. He also accused the Congress of being soft on terrorists. “Rahul baba’s guru Sam Pitorda said do not bomb (Pakistan) but negotiate… Rahul baba if your party wants to do ‘Ilu Ilu’ with terrorists you can do that. But our intention is clear, if a shot is fired, we will reply with a bomb,” the BJP president said while addressing ‘Vijay Sankalp’ (victory pledge) rallies in Badaun and Shahjahanpur districts of Uttar Pradesh. Shah further alleged that during the Congress’s 10-year tenure, no action was taken even when terrorists took away heads of Indian soldiers. “This time it was the Narendra Modi government and not ‘mauni baba’ Manmohan Singh… Within 13 days of the attack, the Indian Air Force went into Pakistan, bombed the terror camps and returned,” he said, referring to the Pulwama attack. He added that BJP workers in Kashmir will ensure that it remains part of India and “intruders” are thrown out of the country. Training his guns at the opposition’s ‘mahagathbandhan’, Shah said the country would have a new prime minister everyday of the week if the grand alliance comes to power. “On one side is the BJP led by Narendra Modi which is working for the country. On the other side is the ‘mahagatbandhan’ of Rahul Baba, ‘behan’ (sister) Mayawati, ‘bhatija’ (nephew) Akhilesh, Congress and others… I ask who is your (opposition’s) leader. It is clear that Modi is our leader and he will be the PM, but who is your leader… No one is telling but I will tell,” he said. The BJP president claimed that the alliance of the Samajwadi Party (SP), the Bahujan Samaj Party (BSP) and the Rashtriya Lok Dal did not have a policy and could not be trusted with the country’s security. “Can any government be run like this? Who will look after the security of the country? Can this ‘gathbandhan’ look after the security of the country?” Shah asked. Only a government led by Modi can give a befitting reply to terrorism and Naxalism and not the SP-BSP alliance or the Congress, he said. Shah also accused the opposition parties of not doing anything for the poor. “Mayawati says that they will work for the poor but the BSP has given tickets to all the rich people and they will never do good for the poor,” he said. He added that Mayawati had gained power in the name of Dalits but she has never washed their feet like Modi did during the Kumbh Mela. Shah said lawlessness prevailed in Uttar Pradesh under the erstwhile BSP and SP governments and the situation changed only after the BJP came to power. He claimed people across India were chanting Modi’s name and they had decided to make him the prime minister once again. The BJP president exhorted the electorate of Badaun, from where the SP’s Dharmendra Yadav had won in the 2014 Lok Sabha election, to join the development journey by voting for Maurya.